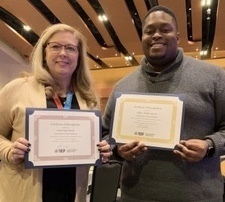 Two Lauderdale County schools were recently recognized at the Tennessee Department of Education’s Partners in Education (PIE) conference in Nashville, Tennessee. Halls High School is designated as a Silver Level Model RTI2B Model of Demonstration school and Ripley Middle School is designated as a Bronze Level school. RTI2B is anchored in the belief that all students require explicit instruction in behavioral expectations and, when needed, appropriate individualized interventions are systematically provided to students. Lauderdale County Schools has been working the past two and a half years to implement our ROAR program which is grounded in the basis and work of RTI2B. Teams at each school have been trained to implement appropriate strategies and programs to encourage and reward positive behavior among the students and staff. Mrs. Shelley Smith and Mr. James Barbee accepted the awards at the conference for their respective schools. Congratulations to Halls High School and Ripley Middle School for this distinguished award.